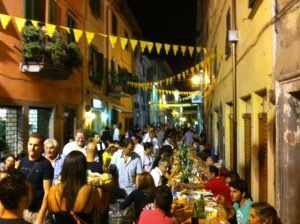 In Peccioli, a small village in Tuscany, every Saturday of September the “Rioni” take place. On Saturdays there is a party in a different neighborhood, where you can try typical foods, that have been prepared in the various roads of the neighborhood from 7 p.m . For the rest of the evening there is entertainment in the various squares and roads of the village, with music and snacks. Fun is insured both for adults, young people and children. Saturday September 6 th: Party of the “Rione Borgherucci” ; Saturday 13 September: Party of the “Rione Fosso” ; Saturday September 20 th: Party of the “Rione Mexico” ; Sabato 27 September: party of the “Rione Carraia”.